This document provides a solution to miscellaneous issues accompanying The Harrington Group’s desktop products in regard to report generation and printing capabilities. This process applies to the Audit Master 3, Corrective Action 6, Calibration Recall 3.5, Document Control System 2, and Maintenance Log Pro products. 1. Perform a Windows search for these three files, Cpeaut32.dll, Crpe32.dll, and Crystal32.ocx. If they are found to exist on the client pc, delete them. 2. Next, browse to your product’s installation directory. These paths are shown below. 3. From inside your product’s installation folder, you will need to locate your database file(s). By default, Harrington Group desktop applications store their application databases in the installation folder. 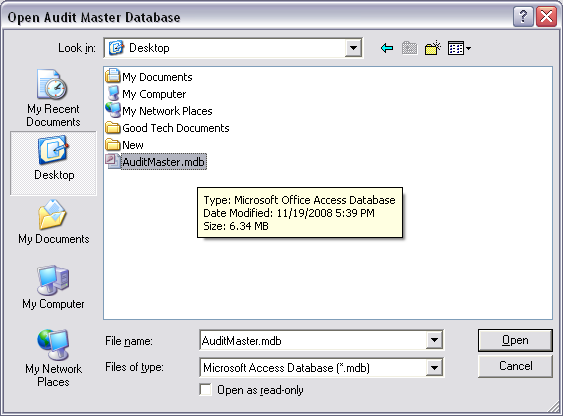 Our software’s database files are standard Microsoft Access database files that have an “.mdb” file extension. They are represented by an icon which appears to display a miniature maroon colored key. If you see any file(s) like this inside your installation folder, make a copy of them then paste them on your windows desktop or a backup folder. If you do not find it in the installation folder, chances are it’s somewhere else on your pc, such as your My Documents folder, a shared drive or in a network folder on a local server. 4. While in your product’s installation directory, double click on the icon called, “Unwise.exe”. 5. The program’s uninstaller will launch, select “Custom”, then click on “Select All”, then click the “Next” button, “Select All” again, “Next”, “Select All”, “Next” button…keep repeating “Select All” and “Next” until the button changes to say “Finish”. 6. When the uninstall process is finished, proceed to our website to download the latest version of your product, or reinstall the application from disc. A link to our website is below. 8. From the open file window, you will need to browse to your database file, click on it once, then press the “Open” button. If you have copied and pasted your database file from the installation folder to your desktop screen as demonstrated in step 3, you will need to browse to your desktop via the file open window, click on your database and press the “Open” button. If your database file did not reside in the program’s installation folder, you will need to locate where it is on either your pc, a shared drive, or on your local server. If you cannot find your database file, your IT Manager may be able to assist you by searching for an “.mdb” file that you recognize. The “Open File” window resembles the below image. Note: After the program has been reinstalled it is recommended that you move your database file(s) back into the installation directory if you previously moved them before the uninstall. If they are in an external location, then you can leave them. 9. After opening your database via the open file window, you will be prompted with a login screen. Login to your database as you normally would. 10. Try to run a report and observe if the original report issue still exists, if it does, try contacting us for further support via e-mail at: support@harringtongroup.com. This document should be used as a first step in troubleshooting any reports issues. Please follow this procedure before contacting technical support.